In this series of posts, we are taking a look at how to develop the congruence theorems found in the CCSSM using a transformations-based approach. In this post, we prove one of the most classic results in elementary geometry: the Isosceles Triangle Theorem. Standard G-CO.9 demands that students be able to prove theorems about triangles, including the fact that the base angles of isosceles triangles are congruent. Reflections and rotations each explain a particular type of symmetry, and the symmetries of an object offer insight into its attributes—as when the reflective symmetry of an isosceles triangle assures that its base angles are congruent. In the approach taken here, two geometric figures are defined to be congruent if there is a sequence of rigid motions that carries one onto the other. This is the principle of superposition. The idea of this theorem is simple: an isosceles triangle has a fold line, and when the figure is folded along this line, the base angles are made to match up. 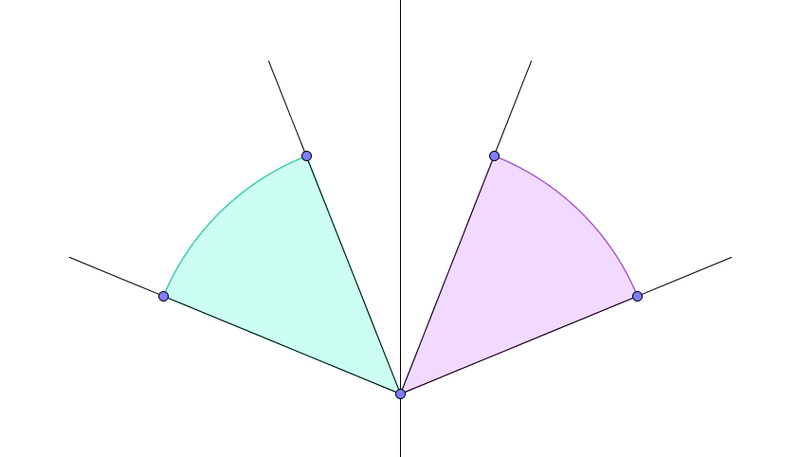 The angle bisector has been useful in our discussion of symmetry up until now, and this figure is no exception. Triangle is isosceles with . 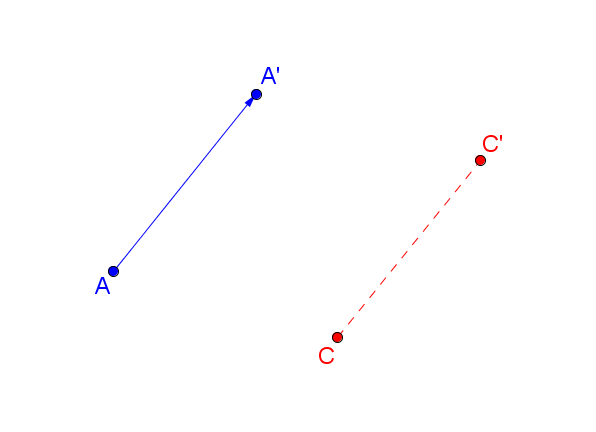 Line bisects . Click here to interact with this figure in GeoGebra. We’ve already done the heavy lifting to establish the Side-Switching Theorem and the Equidistance Theorem – this proof will be a cinch by comparison. The essence of the argument is that angles and are mirror images in line . To prove this, we’ll show that the mirror images of points , , and are , , and , respectively. Let be the line through and , and let be the reflection over line . We’ll show that . What is the mirror image of point ? Since is on line , . What is the mirror image of point ? of point ? We are given that . The Equidistance Theorem tells us that the bisector of is a mirror for and , so and . What is the mirror image of ? Since , , and , it follows that . How does this establish that the base angles are congruent? Since a reflection is a rigid motion, it follows that . This completes the proof that the base angles of an isosceles triangle are congruent. Key ideas for this proof include 1) the definition of reflection, 2) the Equidistance Theorem, and 3) the definition of congruence. The line of symmetry bisects the vertex angle. The line of symmetry is the perpendicular bisector of the base of the triangle. The line of symmetry contains the median to the base of the triangle. Proofs are left to the imagination. Next up: can a triangle have more than one line of symmetry? What can we say about such triangles? In a previous post, we showed that the mirror line for a segment has a special property: each point on the mirror line is equidistant from the endpoints of the segment. In this post, we’ll examine the converse of this theorem: if we have a point that is known to be equidistant from two points and , does this mean that has to be on the mirror line for and ? It seems intuitive that the bisector of will also act as a mirror for and . 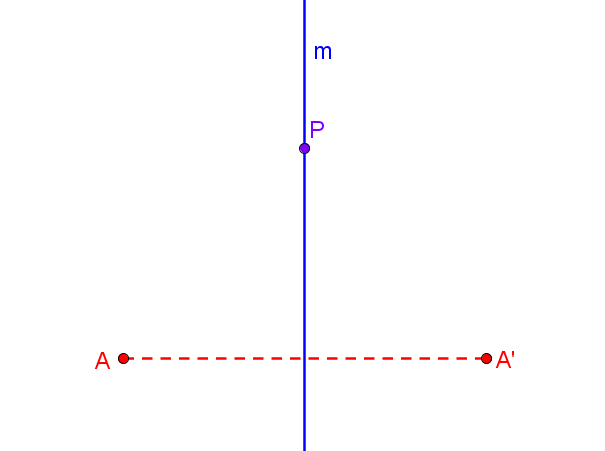 Point is equidistant from and , and line bisects . Let be the bisector of , and let be the line through and ; let be the reflection over line . We’ll show that the endpoints of segment are symmetric with respect to line . Do and have a common initial endpoint? Yes – since is on line , . Do and lie on a common half-line? Yes – since is the bisector of , the Side-Switching Theorem shows that , so lies somewhere on ray (as does point ). Do and have the same length? Yes – we are given that , and since reflections preserve distance, as well. It now follows that . In particular, . This implies that line is the mirror line for and . Since point is on line , this completes the proof that is on the mirror line for and . This proof makes use of 1) the definition of reflection, 2) the Side-Switching Theorem for angles, and 3) the fundamental assumption that reflections preserve distance. The points on the perpendicular bisector of a segment are exactly those that are equidistant from the segment’s endpoints. This theorem has many applications. In particular, it will play a critical role in our proofs of the Isosceles Triangle Theorem, the Segment Congruence Theorem, and the Side-Side-Side criterion for triangle congruence. The Equidistance Theorem is also discussed at Illustrative Mathematics, although at present the logic is problematic, as one of the commenters points out. In high school, students can be expected to use logical reasoning to demonstrate that a given figure is line-symmetric. In order to do this, we need to take the intuitive idea about “folding the figure along a line into matching parts” and turn it into a statement that is mathematically precise. Definition: let line be given. A figure is line-symmetric with respect to if the reflection over line maps onto itself. That is, . 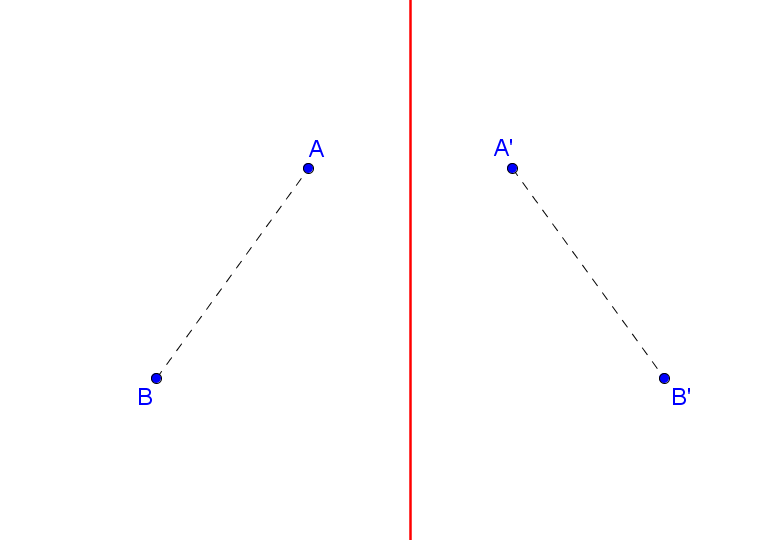 An angle is an extremely simple example of a line-symmetric figure. Students can explore this phenomenon by tracing an angle on a piece of patty paper, then folding the paper so that the two sides coincide. In this post, we’ll explore the logic underlying what some texts refer to as “The Side-Switching Theorem.” The aim of the proof is to show that there is a line in which the sides of the angle are mirror images of one another. That is, we’ll find a suitable reflection with and . It seems intuitively correct to say that the mirror should be the line that bisects . How can we prove that this is so? 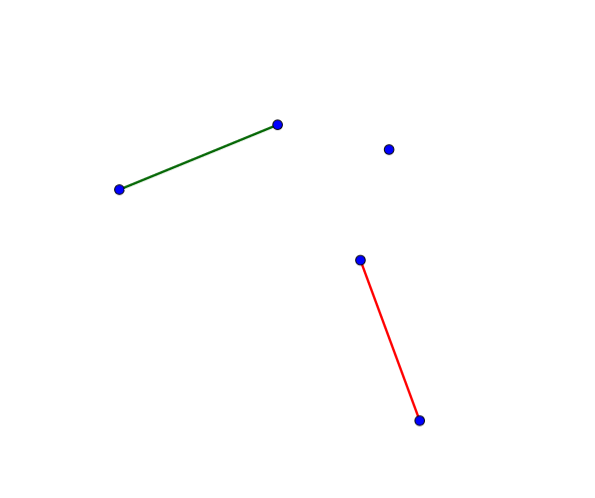 Click here to interact with the figure in GeoGebra. Let be the line through and , and let be the reflection over line . We’ll show that the sides of are symmetric with respect to line . Do and lie in the same half-plane relative to ? Since lies to the left of line , its mirror image must lie to the right of , as does . Do and have a common initial side? Since points and are on line , . Do and have the same degree measure? Since line bisects , we have . And since reflections preserve angles, we can be sure that as well. It now follows that coincides with . In particular, , which implies that also. 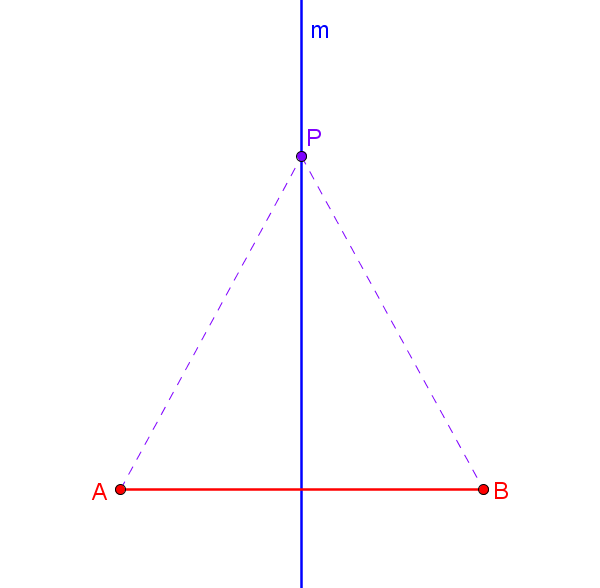 This completes the proof that is line-symmetric with respect to its angle bisector . The proof above makes use of three important ideas: 1) the definition of reflection, 2) the fundamental assumption that reflections preserve angles, and 3) the Protractor Postulate. In the previous post, we showed that all of the points on the perpendicular bisector of a segment are equidistant from the endpoints of the segment. But are these the only points with this equidistance property? Let’s use the properties of reflections to show that they are. Let segment be given, and let be a point in the plane that is equidistant from and . To show that is on the perpendicular bisector of , we’ll find a line through in which is the mirror image of . That is, we’ll show that is the image of under the transformation that reflects the plane over line . First let’s construct a circle through centered at . Since and are the same distance from , this circle passes through as well as . Which line through will act as a mirror for the endpoints of ? The entire figure appears to be line-symmetric, but we need some way of describing the line of symmetry. To that end, let be the point that divides the arc from to into two equal parts, and let be the line through and . Let be the reflection of the plane over line – we’ll show that maps onto . Let . To show that , we need to answer two questions: How can we be sure that is on the same circle as and ? How can we be sure that is located precisely at point on this circle? Since and reflections preserve distance, and must be equidistant from . That is, and are on the same circle centered at . Let represent the measure of arcs and . Since , , and reflections preserve angles, the measure of must be as well. Since there is only one counter-clockwise arc from with degree measure , it follows that coincides with . Having shown that , it follows from the definition of reflection that line is the perpendicular bisector of segment . But point is on , which means that is on the perpendicular bisector of – this was to be proved! This theorem has many applications. In particular, it will play a critical role in our proof of the Side-Side-Side criterion for triangle congruence. What do these figures have in common? Answer: they all have reflection symmetry! Being able to predict the effect of a reflection, to recognize figures that have reflection symmetry, and to make inferences about the attributes of line-symmetric figures are all key skills for students of geometry. But in order to reason about reflections, we first need to formulate a precise definition of this term. The CCSSM call for students to be able to do this in Standard G-CO.4. Let line be given, and let be the reflection of the plane over line . Intuitively, line acts like a mirror, and the reflection over sends each point to its “mirror image” . Another way to think about reflections is to represent the plane with a sheet of paper, then crease the paper along line . Folding the paper in half should superpose onto its image . The definition below captures our intuitions about reflections in a mathematically precise way. If point is on line , then fixes . That is, . Let be a point that is not on line . 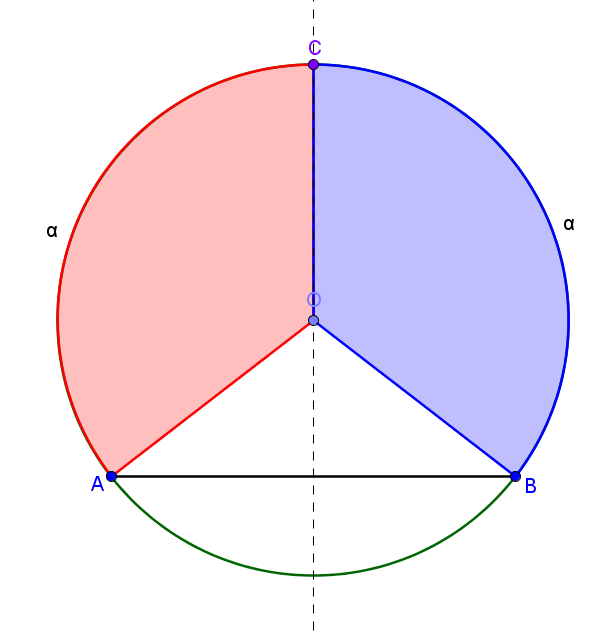 In this case, takes to a point for which is the perpendicular bisector of the segment . What kinds of inferences are available from this definition? If line is the perpendicular bisector of segment , then . A reflection interchanges pairs of points: if , then . If the reflection over line takes point to point , then must be the perpendicular bisector of segment . The task of defining a reflection is described further at Illustrative Mathematics. Homework: which of these theorems can be proved by performing a single reflection? Next up: let’s use reflections and line-symmetry to prove some theorems. The concepts of congruence, similarity, and symmetry can be understood from the perspective of geometric transformation. Fundamental are the rigid motions: translations, rotations, reflections, and combinations of these, all of which are here assumed to preserve distance and angles (and therefore shapes generally). This excerpt raises several questions: what exactly is a transformation? What is a rigid motion? And what does it mean to preserve distance and angles? Let’s take these questions one at a time. What is a transformation of the plane? Standard G-CO.2 speaks directly to this question: we read that students must be able to “describe transformations as functions that take points in the plane as inputs and give other points as outputs.” This same standard also calls for students to be able to “compare transformations that preserve distance and angle to those that do not.” In other words, students should be able to determine which transformations are rigid motions and which are not. Let’s give this term a precise definition. Definition: a rigid motion is a transformation of the plane that preserves distance and angles. What does it mean to say that a transformation preserves distance? Let be a transformation, and let and be any two points in the plane. is a distance-preserving function (or isometry) if the distance between and is the same as the distance between and . That is, and remain the same distance apart even after being transformed. Which of the familiar transformations are rigid motions? Axiom 1: reflections are rigid motions. Axiom 2: rotations are rigid motions. Axiom 3: translations are rigid motions. What does it mean to say that a transformation preserves angles? Let be a transformation, and let be any angle in the plane. preserves angles if the measure of is the same as the measure of . That is, the measure of remains the same even after being transformed. There you have it! The facts outlined above will be used repeatedly as we develop theorems about congruent figures. Together with the definitions of reflection, rotation, and translation, the axioms above form the backbone of the theory of congruence by rigid motions. 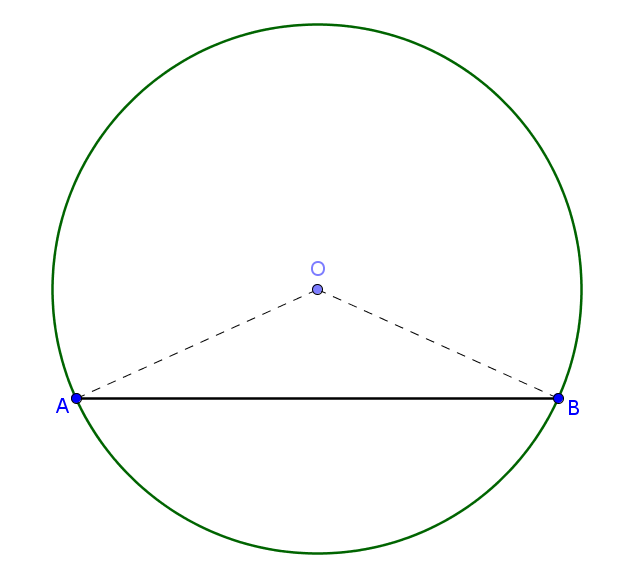 What is special about points that lie on the perpendicular bisector of a segment? In the figure below, it looks as if each point on is equidistant from and . How can we prove this? Let segment be given, and let line be the perpendicular bisector of . Let be a reflection over line , and let be an arbitrary point on . To prove that is equidistant from and , we essentially just need to answer two questions: where does take point , and where does it take point ? Since is on , . Since is the perpendicular bisector of , . Since reflections preserve distance, the distance from to is equal to the distance from to . That is, the distance from to is equal to the distance from to . This completes the proof! Key points: to establish the theorem, we used the definition of reflection (Standard G-CO.4) and the fundamental assumption that a reflection is a rigid motion (and thus it preserves distance). 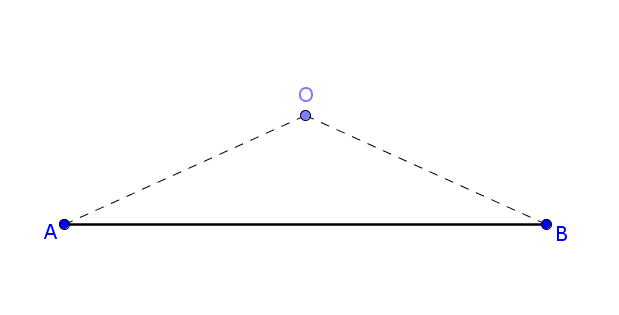 Next up: having shown that the points on the perpendicular bisector of a segment have a particular equidistance property, it’s natural to wonder – are these the only points in the plane with this property?